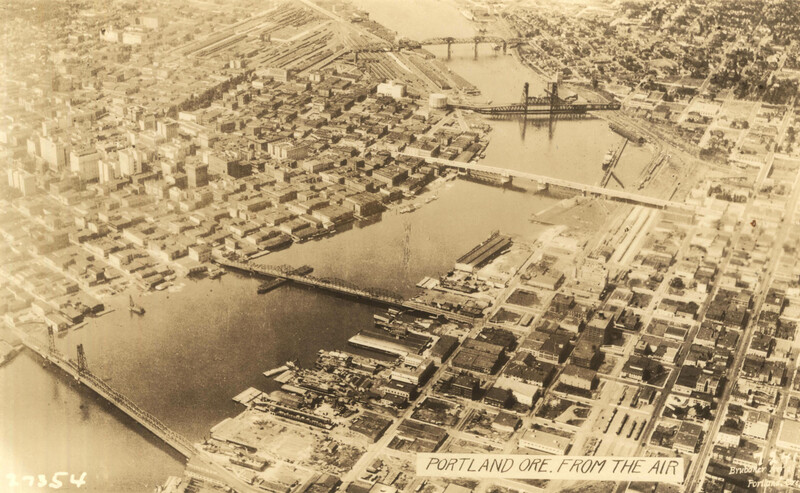 The Portland of circa 1926 is familiar to us today but oh, so many changes! All of our downtown river crossings were in place, including a new Burnside Bridge. It would be another three-quarters of a century before all the rails in Northwest would be ripped up to create the Pearl District. The west side seawall was only a few years from realization, and the relentless march of the bulldozers had yet to create the patchwork of surface parking lots that in many cases still exist. On the east side, the riverfront was still highly industrial, Albina was untouched, and it would be decades before freeways cut off much of this area from the river. 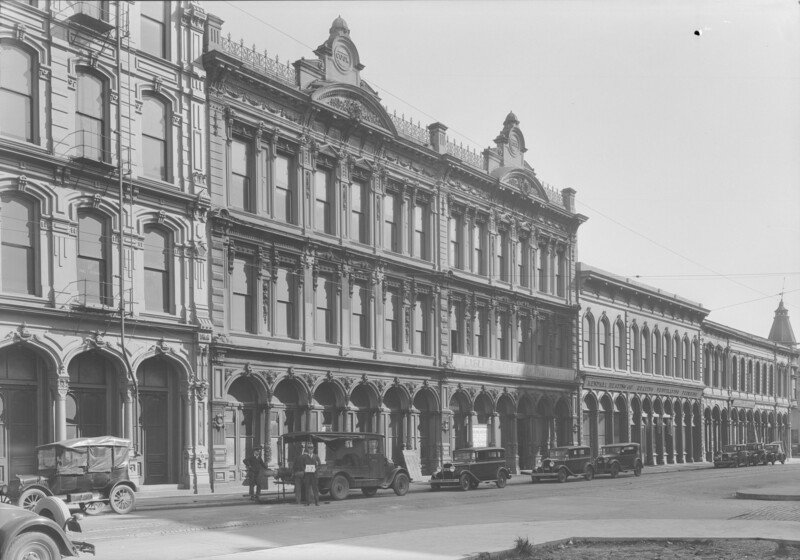 This 1929 photo shows a row of magnificent cast-iron fronted buildings along the east side of SW Front Avenue at the foot of Vine Street. Vine no longer exists but is a part of Ankeny Plaza between Ankeny and Ash Streets. From the left, the buildings are Dodd Block (1888), Cooks’ Building (1882), Ankeny & Watson Building (1868), and Central Block (1879) on the corner at Ash Street. All were demolished in 1942. 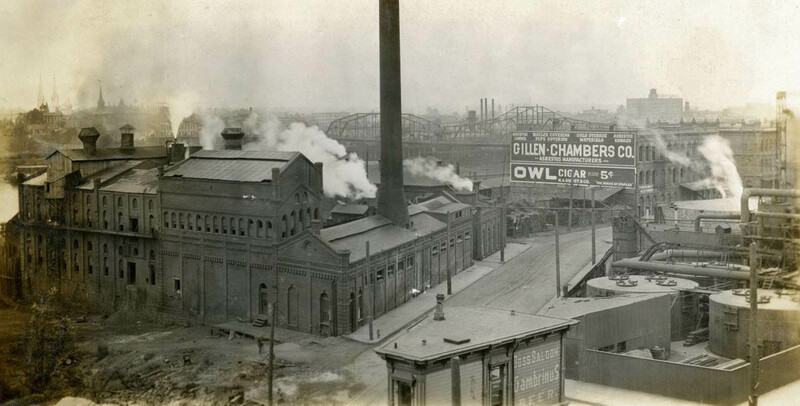 This rather Gothic industrial scene shows the Portland Gas Company complex in Northwest Portland in 1912. We’re facing southeast, with Front Avenue going off to the right and Flanders Street making its unimproved way to the Willamette River on the left. As rough as the Boss Saloon probably was, the little building seemed to have some nice architectural details. The 1894 Burnside Bridge can be seen in the background. Looking west on SW Washington through its intersection with 3rd Avenue, we can see that streetcar and horse traffic were the main (or maybe only) modes of transportation in downtown Portland in 1910. 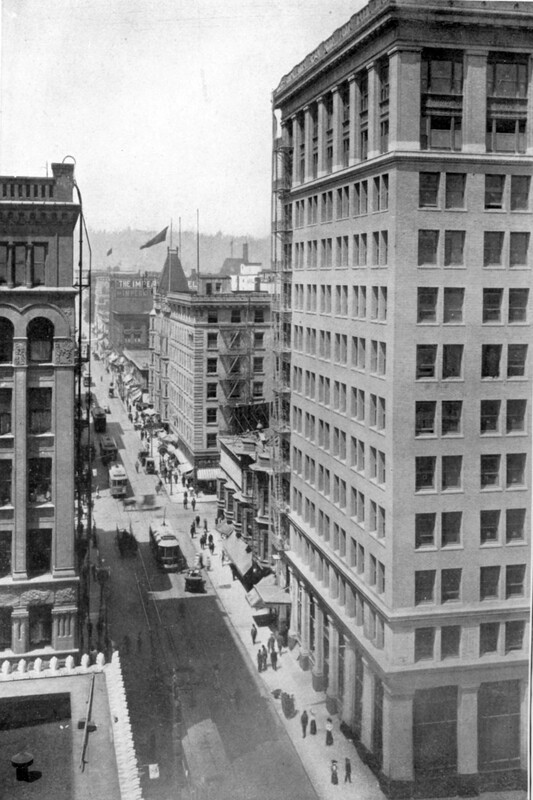 The Dekum and Spalding Buildings straddle Washington in the foreground, while the Perkins Hotel at 5th Avenue can be identified by its pyramidal roof. VP fan David Lewis submitted this great photo of Grant Park Grocery & Market personnel in front of their shop at NE 33rd and Knott Street. 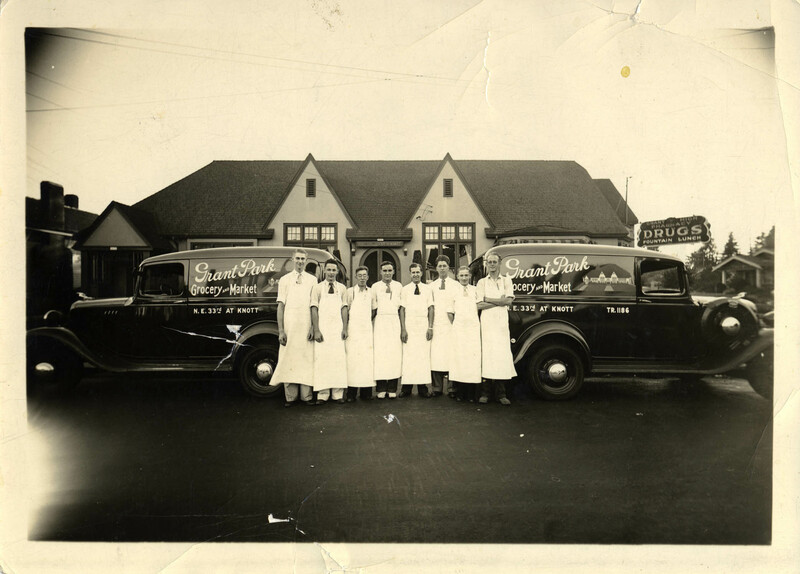 The distinctive building, echoed on the sides of the panel delivery trucks, is now a family medical office. Thanks for the great find, David! Having trouble finding the corner of NE Union and Eugene on your modern maps? 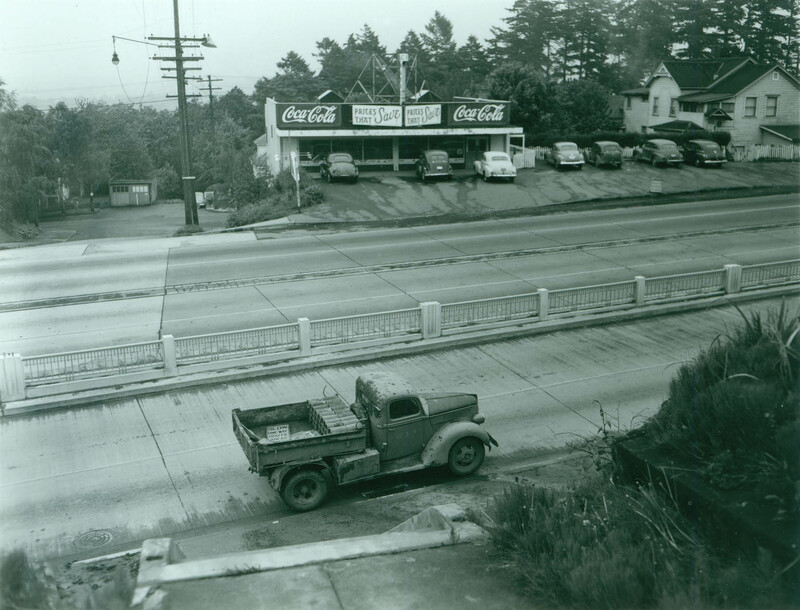 That’s because you’d now be looking at NE MLK Blvd and Thompson Street. 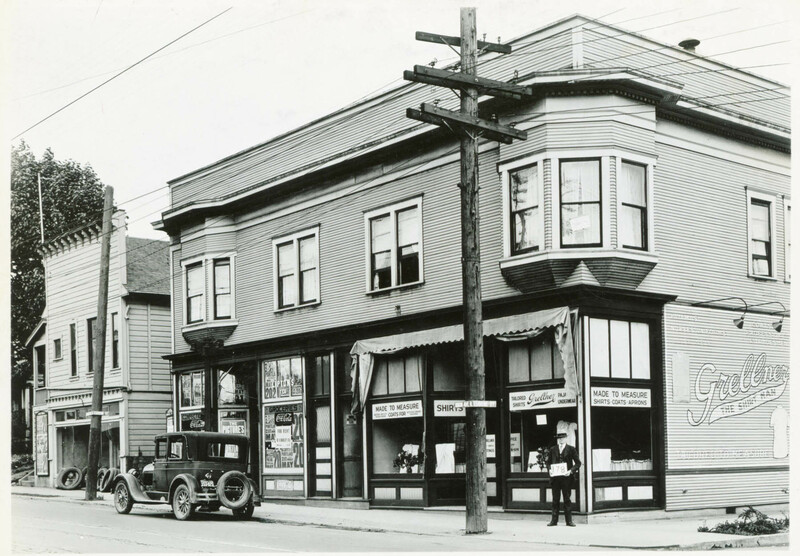 Before the street renumbering of 1933, Eugene Street ran between Williams and 7th Avenues. Those three blocks became Thompson in 1933. Here’s a reversal of yesterday’s view at SW Barbur Blvd. Taken the same day, this photo looks east across Barbur from the top of the stairs we saw yesterday. The market across the way is gone now but the building remains; on the left you can see down SW Lowell Street to Corbett Avenue. Enter your email address to subscribe to Vintage Portland and receive notifications of new posts by email.